Today’s texts cluster around two major themes that are very important to children. So, I have organized this post around the themes. The texts are all there but not in the usual order. & Show a Bible that you have all but used to death. 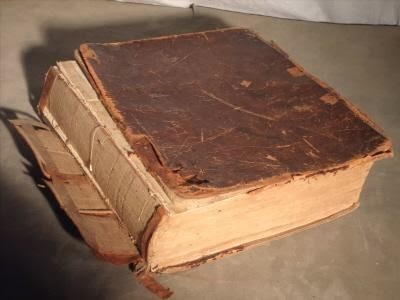 Tell how you got it into this state and note that most of what has made this book so ragged is now so much a part of you that if the book fell apart completely, you’d still have most of it inside you. Encourage others to use a Bible to pieces. & If there is a large Bible displayed and read from in the sanctuary that has a history, tell that story and bring it to where worshipers of all ages can see it during or after the service. & Identify all the places the Bible is used in worship. Print a clip art Bible beside each Bible based item in the order of worship. Or, give children Bible stickers to place beside those elements as you come to them. & Pray for all the study groups and church school classes for students of all ages in your congregation. Do so in a way that obviously includes children’s and youth classes. Go home, find your copy of God’s word. If you don’t have one, buy one. Read it. Think about it. Talk about it. Hug it to your chest. Let the story in it become your story. Let it become your guide for living every day. & Verse 33’s “God’s word written on our hearts” will need to be explained to literal thinking children. Laugh at the misunderstanding of God digging your heart out of your chest and writing on it with a pen. Then work toward Jeremiah’s message by reminding them of what it means to put your hand over your heart when you say the Pledge of Allegiance, recalling the oath “cross my heart” that says “I really do mean this,” and exploring what you are saying when you give friends paper hearts on Valentine’s Day. Children working through this quickly understand that having a Bible isn’t worth much. It is only when you read it and use it that it becomes yours. & This text appears again on the Fifth Sunday in Lent (Year B). Go to Fifth Sunday in Lent (Year B) for more ideas. & Psalm 119:103 compares scripture to the sweetness of honey. 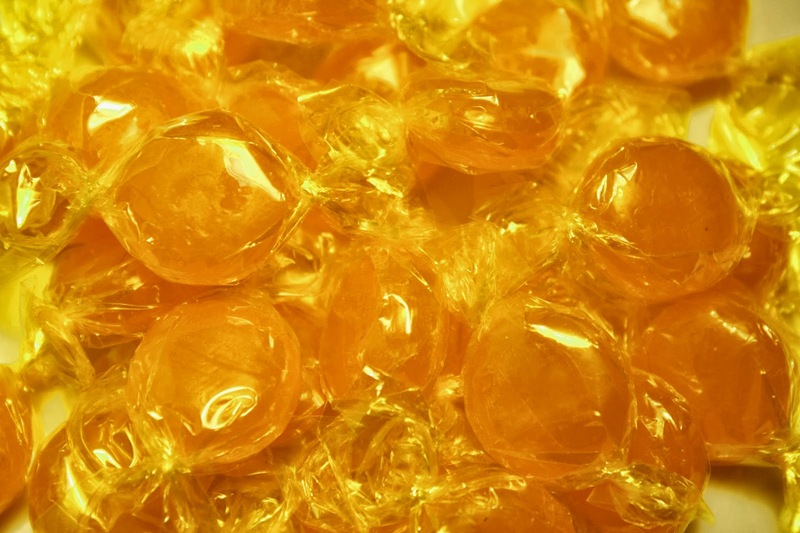 So, before reading it give everyone a honey flavored hard candy to enjoy and as a reminder of the sweetness of what they are hearing read. Prepare a children’s class to read the psalm with one child reading each verse. The children stand in verse order across the front of the sanctuary and read from paper scripts laying across Bibles which are open in their hands. 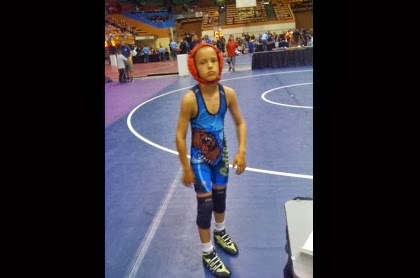 Jacob was strong enough and determined enough to wrestle all night long. It would be great to be that strong. At the end of the night God gave Jacob a name that praised him for struggling with God and being able to keep up the fight until dawn. That means wrestling with God is OK.
Jacob is left with a limp for the rest of his life. That demonstrates that struggling with God can be hard on you – but it is worth it. Vanderbilt Divinity Library, Nashville, TN. [retrieved September 19, 2013]. Original source: www.yorckproject.de. a Before reading this story display or project this or some other picture of Jacob wrestling the angel. Children will be so surprised to see someone fighting an angel that they will not believe what they think they are seeing. It is important to look at the details with them so they understand what is going on. Point out Jacob and ask children to describe him. Ask who Jacob is fighting with. How hard is Jacob fighting? How hard is the angel fighting? 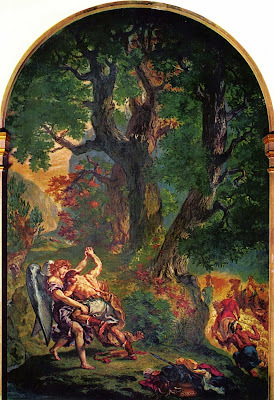 Then read the story and ask “was it OK for Jacob to wrestle with the angel?” (The answer is yes – and amazes children.) Point out to older children that even though few of us physically wrestle with an angel, we often struggle with God. Things happen that we don’t understand or like. We get angry with God. We think God owes us an explanation. That is OK. God understands that. a Jacob wrestled with God all night. The widow struggled with the unjust judge until he gave her justice. Both had to stick with it in a long struggle. Every kid who has asked repeatedly for something and been told “That is enough!” is drawn to Jesus using the woman who pestered the judge until he did what he did not want to do just to get rid of her. Jesus’ message is that there are times when being a pest is exactly what is needed. This is an opportunity to tell stories about the church being a pest working in the community on behalf of those whose needs are being overlooked by people in power. a Timothy is to be as persistent as Jacob and the widow. He is to stand up for what he knows is important and right even when it is hard. Children need to hear this message too. They, like Timothy, often face hard choices and situations in which it is tempting to say, “I can’t do anything, I am just too young.” Paul tells them that they can be disciples right now – even when it is hard. a Persistent is a big word. Introduce it at the beginning of worship with a poster or banner displaying the word. Define it and alert worshipers to listen in worship for people who were persistent and people who needed to be more persistent. Challenge them to think of situations in which they need to be persistent. 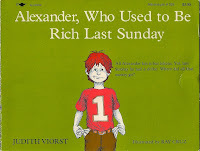 a If it is Stewardship season, explore the way many of us wrestle with our money by reading all or part of Alexander Who Used to Be Rich Last Sunday, by Judith Viorst. (Yes, this is the same Alexander of the Alexander and the Terrible, Horrible, No Good, Very Bad Day.) 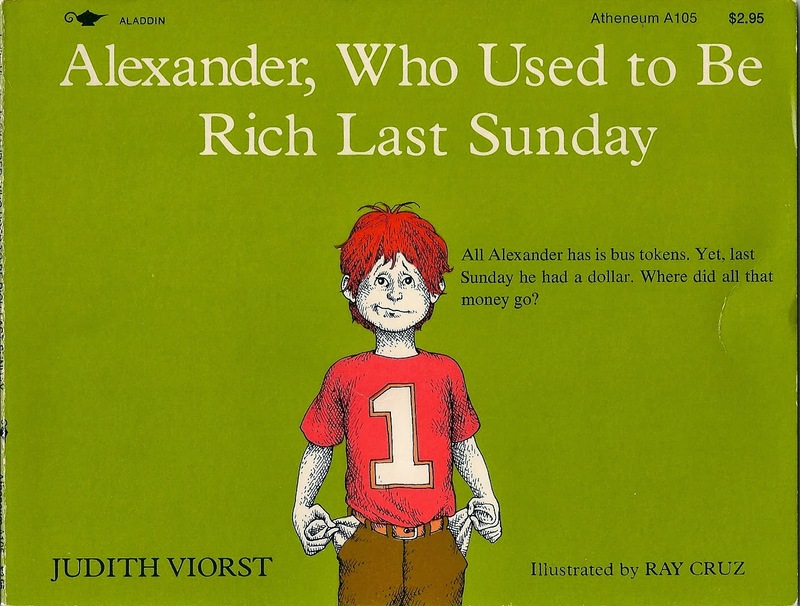 The book describes all the foolish ways Alexander spent the dollar his grandparents brought him until he was left again with no money, only two bus tokens. He struggles over every purchase. Reading the whole book takes about seven minutes. Since it gets repetitive, reading the first several pages is all that is needed to get everyone “into” the subject. Reading it as part of the sermon teaches children that money is one of the things people struggle with at all ages. Do you plan on doing an entry for children's sabbath this year? Your thoughts are always so helpful and I would be curious to see your ideas. Stephanie, go to http://worshipingwithchildren.blogspot.com/ for my few suggestions and the link to the Children's Defense Fund site resources for the day. The texts for the day are full of calls to listen to people around us - especially the small and powerless.